"If these dams are built, everything will end," says Lamberto Painha, one of the chiefs of the Munduruku tribe in Brazil's Amazon region. "That village over there will be flooded," he points. "Monkeys, birds, Indians - we'll all lose our homes." 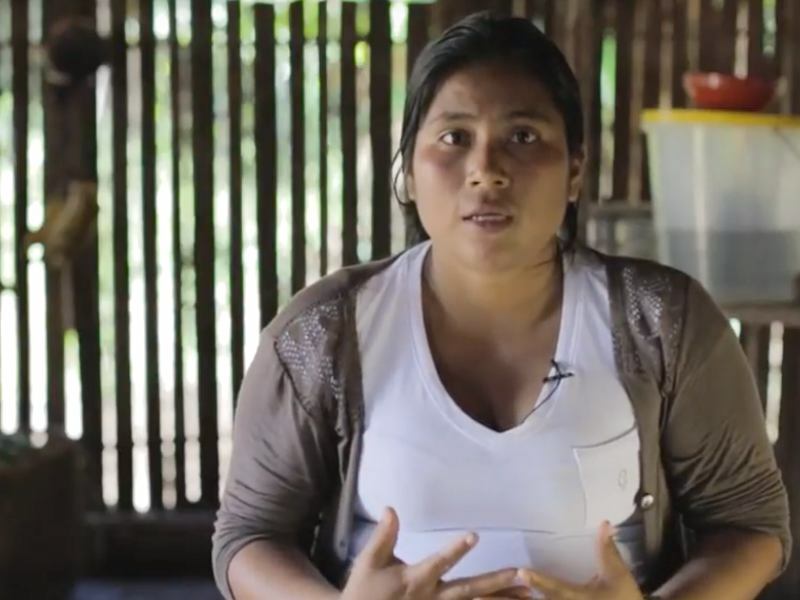 Over the last few months some 13,000 Munduruku have been protesting against government plans to build a series of hydroelectric dams that will flood part of their land on the upper reaches of the Tapajos river. After a week-long meeting back in April, the caciques (chiefs) from more than 60 villages issued a statement, demanding that the government listen to them before it presses ahead with the five dams planned for the river. Women have not traditionally been fighters among the Munduruku, but now Maria Leusa Kaba Munduruku, the leader of a new group of female warriors, says that everyone must be involved. "The government must recognise our rights, not just those of others," she stresses. Despite vociferous opposition from indigenous and environmental groups, construction is already well under way for the gigantic Belo Monte dam on the Xingu river. Now the new frontier for Brazil's hydropower expansion has moved to the Tapajos River - a huge tributary to the Amazon that lies further to the west. Opposition here is fierce as the region has some of the richest biodiversity in the world. Adrian Barnett, a British biologist working in the area, says that - even by the high standards of the Amazon basin - the Tapajos is an area of extreme biological richness. Of the 1,837 species of bird that occur in Brazil, 613 can be found in the Tapajos, he points out. The government plans to award the contracts for the first of these dams, Sao Luiz do Tapajos, later this year. Along with the next dam, Jatoba, it should come on stream by 2020. As well as flooding 552 sq km (213 sq miles) of land, the dikes will change the river flow, disrupting the lives of indigenous and numerous fishing communities. The dams will have an installed capacity of 8,471 megawatts and will generate as much electricity as Belo Monte. To mitigate their environmental impact, the government is copying the oil-rig system used in the North Sea, bringing in workers by boat for two-week work shifts rather than building roads. The authorities are adamant that they need to tap into the huge hydropower potential of the Amazon if Brazil is to have the energy to fuel its ambitious development programme. Claudio Salles, director of the Acende Brasil energy think tank, says that of the 19,000 additional megawatts the government plans to have by 2021, 16,000 will be generated in the Amazon. "This gives you an idea of just how important this energy is for us," he says. But some analysts believe that Brazil needs to rethink its development plans. Celio Bermann, a lecturer in energy and the environment at the University of Sao Paulo, says Brazil is providing big subsidies for electricity-hungry sectors, such as the smelting of bauxite in the Amazon to make aluminium, without thinking whether this is really in the country's long-term interests. "We are exporting a tonne of aluminium for $1,450-1,500 (£855-884) while importing manufactured aluminium goods at twice the cost. "It makes no sense. I think it is absolutely undesirable for the country's aluminium output to double over the next 10 years," Mr Bermann adds. Brazil, he points out, is going back to being a producer of primary goods, without adding value. "And it is precisely the production of primary goods that needs a lot of energy and generates few jobs." Preparatory work for the construction of the Teles Pires dam to be built on the Teles Pires river, a tributary of the Tapajos, has already led to the bulldozing of land around the Sete Quedas (Seven Waterfalls) - an area considered sacred by the Munduruku and other indigenous people. In an open letter, Munduruku leaders complained: "There are funerary urns there, where our ancient warriors are buried. There is also a portal, only seen by spiritual shaman leaders, who can travel through it to another, unknown world." "Why have they destroyed this?" one cacique asked. For others, however, progress cannot be halted. Joao Francisco Vieira, a local councillor in the town of Jacareacanga, told the BBC: "The Indians don't want to go back 300 years. They want to evolve, as the river flows to the sea. They want mobile phones. They want the internet." Maria Leusa Kaba Munduruku agrees that they want modern goods. "But we want them while conserving our culture. That is possible and we will fight for it."